The owner of medium length hair and long hair have a great opportunity pretty quick to make stylish and still relevant hairstyle that is called "French braid" or "dragon". This braid is perfect for not only boys and girls but older women, because of netting there are several: her weave and all over the head (vertically, across or diagonally), only the forehead, simulating the rim, or round, forming a kind of "basket". "Dragon" can weave and wavy hair, and straight, and smooth, and naughty. comb with a few teeth. Take a comb, preferably with frequent and thin teeth. She will gently and evenly separate the strands from the bulk hair, avoiding the distracting strands (the so-called "roosters"). Prepare a couple of hair elastics. For a certain type of hair (too fluffy or unruly) will also need foam, mousse or varnish - they can help you better cope with the netting, and their use braid for longer preserves the original sleek appearance. Comb (carefully and repeatedly) clean and dry the hair to rid them of spotykany and nodules. The movement of the combs need to produce from forehead to nape. Visually define the line that runs from one ear to another – it will be a benchmark for parallel separation of the strands in the future. With a brush highlight forehead narrow strand of hair (it should go along the same lines from ear to ear). Select a comb in the middle of the resulting strand Central strand, which will be the principal. On either side of this Central strand, still using the comb, gently separate the two strands, which connect with the first as you begin to weave a normal braid. On both sides of the head symmetrically with a comb, separate a thin or wider (to your taste) strands and also the overlap join the two side strands, as if odplata them into the main braid in the center of the head. Move thus from the forehead to the crown, then to the back of the head. 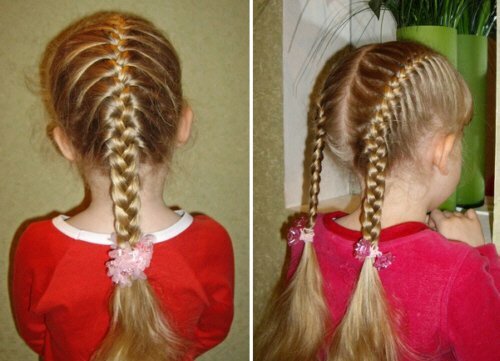 The neck, when the hair to podpletennaya will not remain, you can continue to weave braid "dragon" as braiding a regular braid. Or you can terminate the process in the place where ended Platania hair in the "dragon", and pull hair elastic band, forming a tail. This single "dragon" is the most simple in execution, it is quite possible to braid it herself without assistance. Swipe with a comb even hair from the forehead to nape so that the hair was divided into two parts. Just as when weaving one dragon, capture and weaves to braid the strands first one side of the head, and then the other. Secure braids or tails with rubber bands. You can exercise weave braids "dragon" by placing the braid around the head from one temple across the back of the head to another temple. There is the option of a spit across the head diagonally from the left temple to the right ear lobe. In this case, the braid or tail hair falls beautifully on the shoulder.